Extract OLE Objects from a word document. Is there a better alternative to Office Embedded OLE Extractor? Is Office Embedded OLE Extractor really the best app in AppleScript category? Will Office Embedded OLE Extractor work good on macOS 10.13.4? 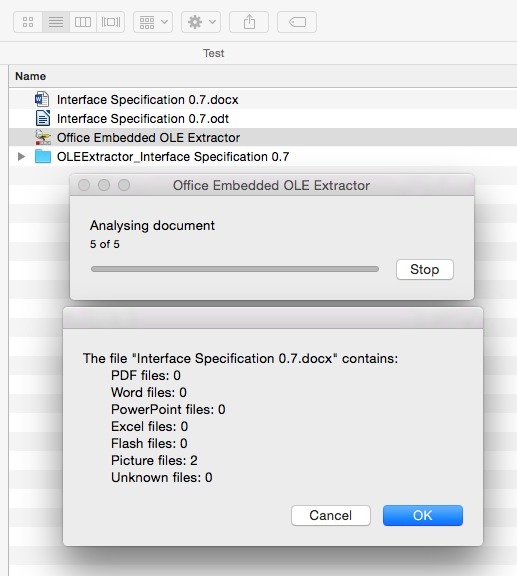 Office Embedded OLE Extractor is an Open Source application that helps you extract OLE objects from Word documents. You will also need to have LIbreOffice, which is required to convert a DOC into an ODT, from which the objects can be unpacked. Office Embedded OLE Extractor needs a review. Be the first to review this app and get the discussion started! Office Embedded OLE Extractor needs a rating. Be the first to rate this app and get the discussion started!